Osteoarthritis is commonly known as the wear-and-tear arthritis. It is a condition in which cartilage, the natural cushioning between joints, wears away. Due to this, the bones of the joints rub more closely against each other with less of the shock absorbing benefits of the cartilage. The rubbing results in pain, swelling, stiffness, decreased ability to move and sometimes the formation of bone spurs. Osteoarthritis is one of the most common types of arthritis. It can occur even in young people, the chance of developing osteoarthritis rises after the age of 45, with the knee being one of the most commonly affected areas. Women are more likely to be affected with osteoarthritis than men. One of the most common causes of osteoarthritis of the knee is age. 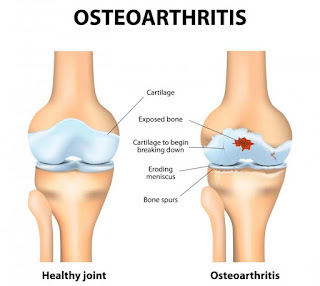 Almost everyone will some time or the other develops some degree of osteoarthritis. However, several other factors also increase the risk of developing significant arthritis at an earlier age. Arthroscopy uses a small telescope and other small instruments. The surgery is performed through small incisions. The surgeon removes damaged cartilage or loose particles, clean the bone surface and repair other types of tissue which are damaged. The procedure is often used on younger patients in order to delay more serious surgery. Osteotomy is a procedure which aims to make the knee alignment better by changing the shape of the bones. An osteotomy is not permanent, and further surgery may be necessary. Joint replacement surgery or arthroplasty is a surgical procedure in which the knee joints are replaced with artificial parts made from metals or plastic. The replacement will involve either one side of the knee or the entire knee. Joint replacement surgery is usually reserved for people over age 50 with severe osteoarthritis. Dr. Bharani Kumar is one of the most recommended orthopedician in Chennai, India. His treatment commences only after the complete diagnosis of the problem and also offers right care at the right time.